Let’s get this out of the way, Square Enix’s Chaos Rings Ω [$11.99 / HD] is identical to the original Chaos Rings in more ways than one. In fact, its differences are so few, it’s hard to differentiate the two and considering Chaos Rings Ω follows the original by a full year, that’s going to be a bit disappointing to fans of the first game looking for something new. By the nature of the narrative in the first game, there is little in the way of expanding the Battle Royale style storyline, which pits you in a fight to the death against a random collection of couples abducted to an arena for the sake of proving their battle-worthiness. Even though this is billed as a prequel, it’s still not the “first" time this the tournament has gone down and it’s clearly not the last. 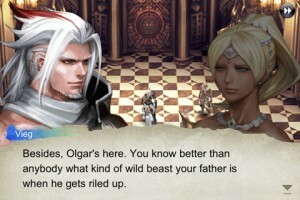 Where the first game told the story from several different viewpoints, Chaos Rings Ω decides instead to tell the main story of Vieg (who you’ll recognize from the first game, perhaps a bit younger looking). This might be a bit jarring to fans of the multiple viewpoints of the first game, but it does allow Chaos Rings Ω to tell a slightly more cohesive story. The setting is the exact same and that goes for the dungeons as well. They’re varied in layout, but considering the first games dungeon designs were essentially randomly put together screens, that’s not really saying much. Since there are different characters, the narrative is tweaked slightly, including a ridiculous mother/child plot involving a not-at-all-pregnant-looking woman who happens to be your wife. Dialogue is on par with the first as well, which is to say, it reads like it’s something closer to fan fiction. Because of that, there are plenty of inadvertent jokes — for instance, during a cut scene where your wife is giving birth, an ill-timed achievement called “Pelvic Pummeler" will pop up in relation to a boss fight you just completed. But if you liked the style and story of the first game, you’ll enjoy this one too. Without spoiling things, you’ll seen connections between the two games and get a few explanations of how the Ark Arena works and where certain situations and characters from the first game came from. Combat, movement, the menus; everything else is the same as the first. That includes the ability to turn off random enemy encounters or alternately, to force one into happening. The puzzles are back this time too, but you can skip them if you fail three times. Combat works on the same two-person tactic as the first, which offers entry level RPG fans a clear and simple system to go with and it’s mixed with enough complexity that you can take it to some extremes to deal hefty damage, but the game doesn’t really challenge you to do so as often as it could. There is also a ludicrously over-done tutorial system at the beginning of the game, which features a tutorial for how to use the “options" menu for no apparent reason. The same goes for the graphics, which are, to be frank, identical to the first, oftentimes seemingly taking assets directly from the original and changing their color. 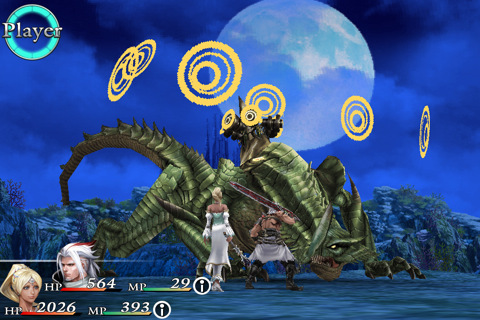 While Chaos Rings had a bit of a shock-and-awe factor going for it, Chaos Rings Ω doesn’t. The weirdly pixelated static backgrounds and poorly textured character designs look significantly dated now. It shouldn’t really matter, but as a whole, it looks like they weren’t trying too hard. There are a flurry of post-release updates planned, including increased level caps and bosses (which only makes sense after you finish the game), but based on their descriptions alone, they don’t really seem that interesting unless you’re an absolute die-hard fan. If nothing else, it’s nice to see Square Enix is coming around to the App Store update model, at least a little bit. By the end of it all, Chaos Rings Ω is solely for diehard fans of Chaos Rings and with the first game currently on sale, you’ll be better of starting there if you’re just a curious passerby. It’s not bad by any means, but it doesn’t even pretend to offer anything different or new. More is more — so if that’s all you’re asking for, you’ll be happy with the way the story fills in the gaps of the first, but if you didn’t like the first or wanted new battle systems or combat, you’ll be disappointed.